To the interior designer Stepan Bugaev appealedA young man working in the oil industry. Over time, he plans to live with his beloved, but for now he lives alone. 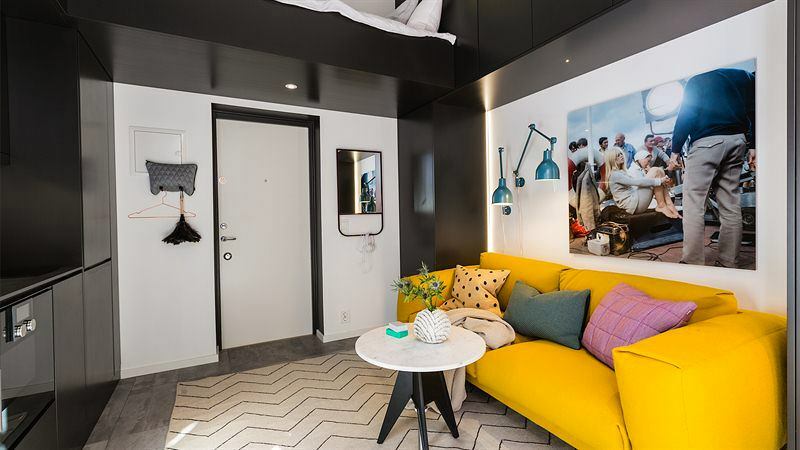 The customer wanted to make a small apartment, while maximally using its area. 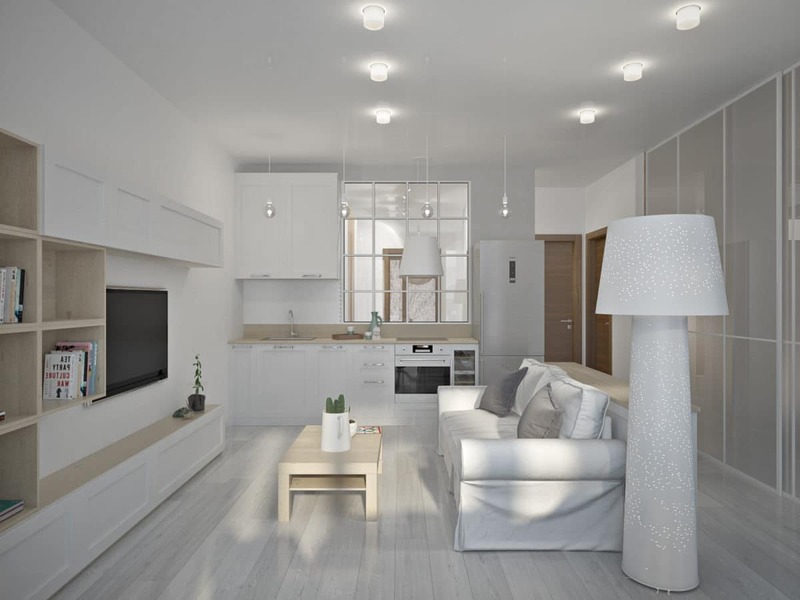 In his opinion, the interior of the future apartment should have a rest, namely - be light, without sharp color contrasts, executed in a pleasant, warm color scheme. Stepan Bugaev, interior designer Graduated from MIPT with a master's degree in physics and SU HSE with a Master's Degree in Business Informatics. Has its own design studio, under his leadership, more than 500 design projects have been implemented. Included in the top 100 best designers, according to the leading interior edition of AD. He is a teacher of the School of Design of the Higher School of Economics, conducts the author's course "Interior Design. Rules for creating a successful project. " Performs with open lectures on the topic of interior design and writes articles for leading interior magazines and portals. 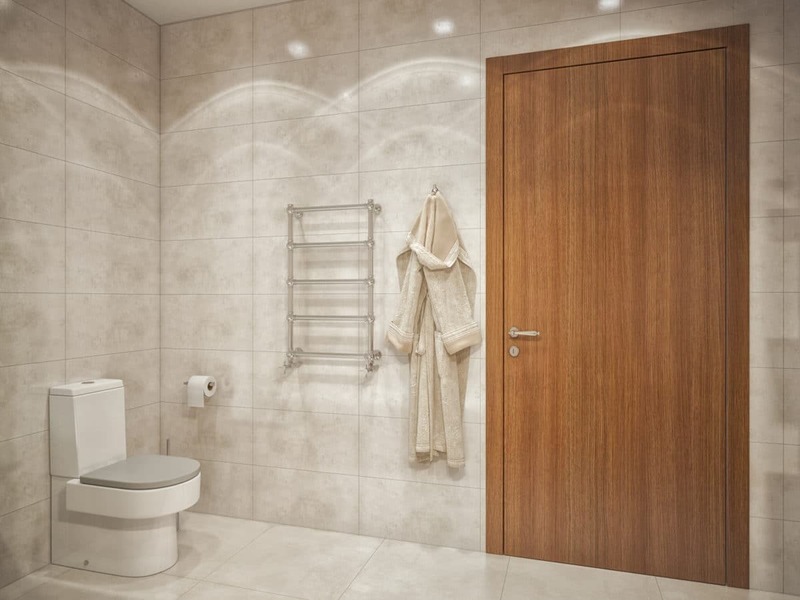 The general concept of open spaceSupported by the layout of the bathroom. 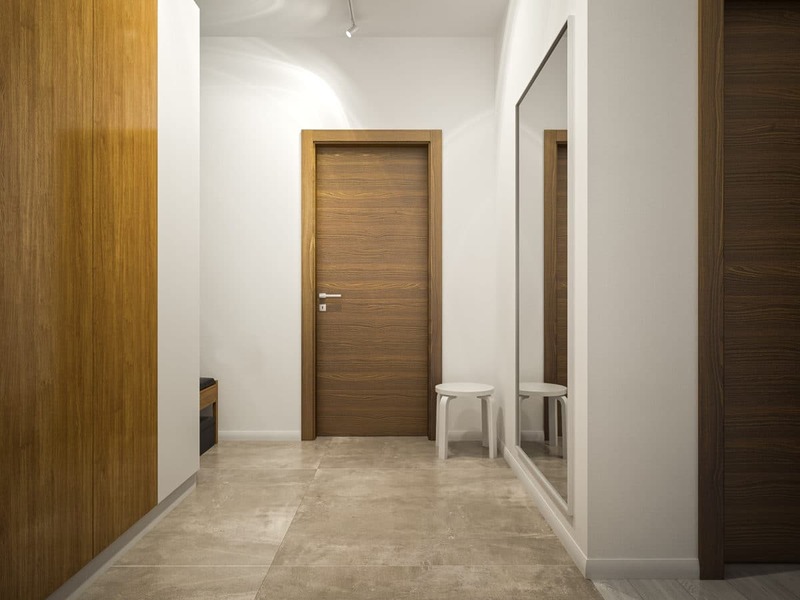 The room is visually zoned due to the pronounced contrast of the rich texture of the wood and light beige tiles. Transparent septum protects the shower area of ​​the bathtub. In the hallway the general concept of creating a spacious,The light-saturated interior is maintained as follows: the studio wall, facing the hall, is framed with a stained glass window. The entrance group, consisting of a hanger with a banquet, a cabinet and a table, is rather concise. 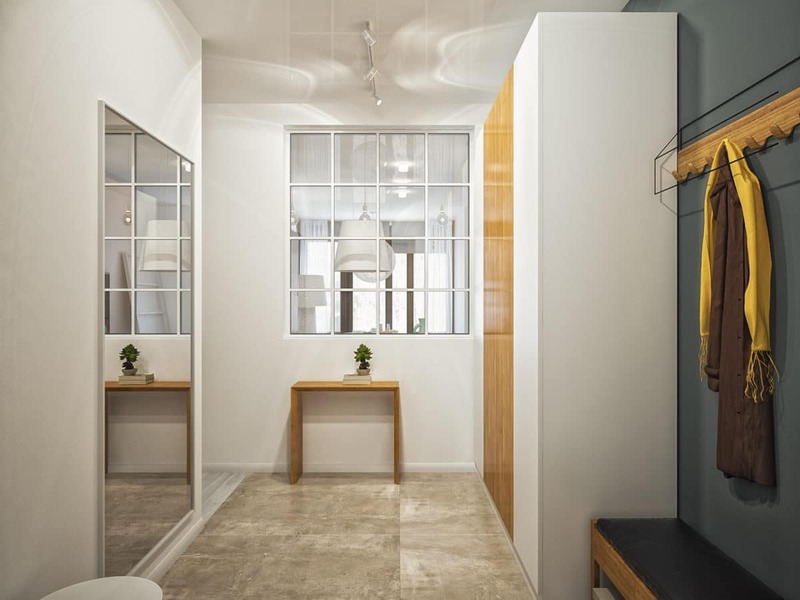 Its simple composition is complemented by a bright color contrast of milky white and golden wood, which are interconnected by a textured floor tile of beige color. 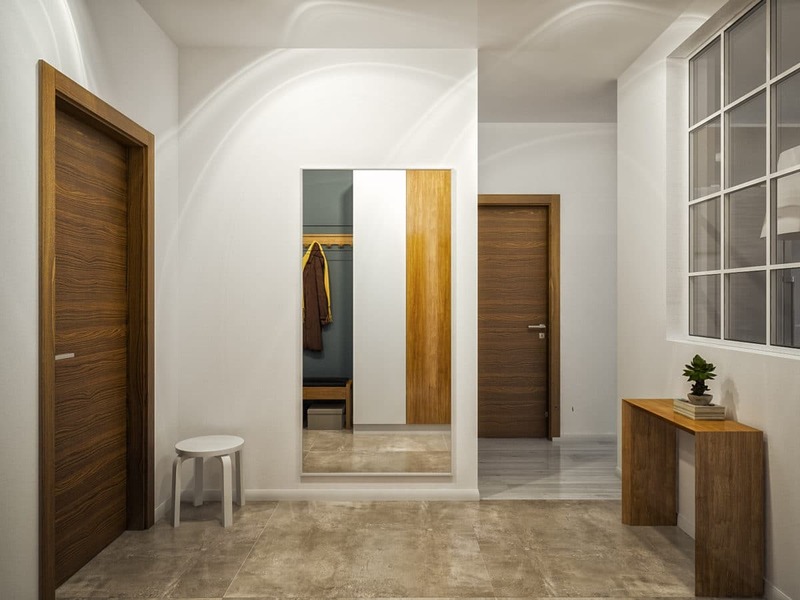 The dressing room, equipped next to the hallway, is responsible for the storage of things. The bedroom is a private place, thatIt is emphasized by separating it from the rest of the space by means of a sliding partition made of frosted glass. It transmits light and, thanks to the glossy surface, sets the depth that visually expands the space. In a pleasant contrast, there is a dark gray wall and a milky-white septum. From golden to chocolate - these are the main warm tones of this group made of natural wood. The bedroom is saturated with warm color thanks to a solid wood array at the head of the bed. The stretched geometry of space is leveled due to an unusual reception - a single decoration of the wall and ceiling. The wooden table and the shelves of the working group are in harmony with the bedroom, including the sleeping area in the general space of the studio, and the chair from the headset of the dining room group combines the cabinet with the rest of the interior. The dining room in the bay window is noteworthy in thatIt is built on the unity of forms with a noticeable contrast of color. 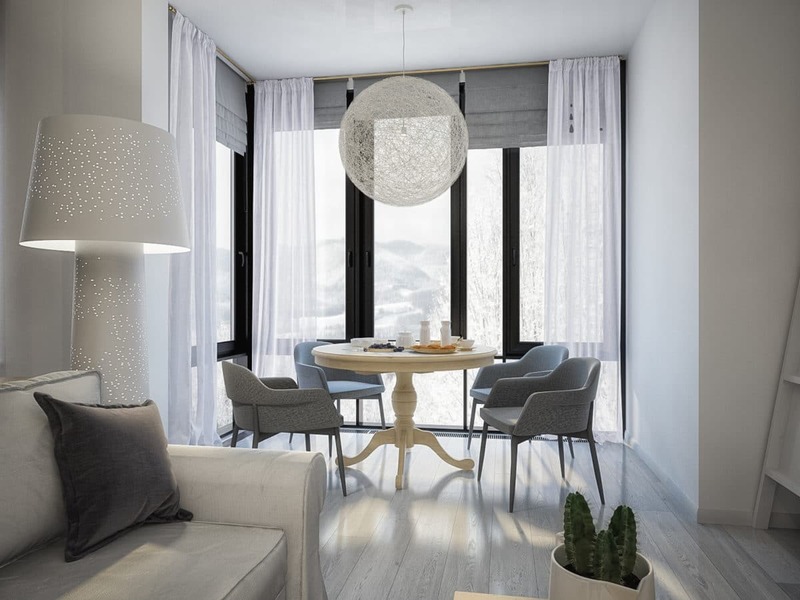 The sense accent of the composition is the harmony of the forms of the countertop and the lamp, which is supported by the rounded outlines of the chairs. Dark window frames can create a special rhythm and enhance the sense of light, and light air curtains on the windows allow the sun's rays to freely enter the room. The natural array of the table is in harmony with the lamp, and the pearl-gray color scheme of the armchairs unites the whole group. The predominant element of the studio zone of steelNeutral light colors and simple outlines of furniture that create a feeling of pleasant simplicity, leveling a complex layout. The basis is taken pure white color, which allows you to save as much light as possible. 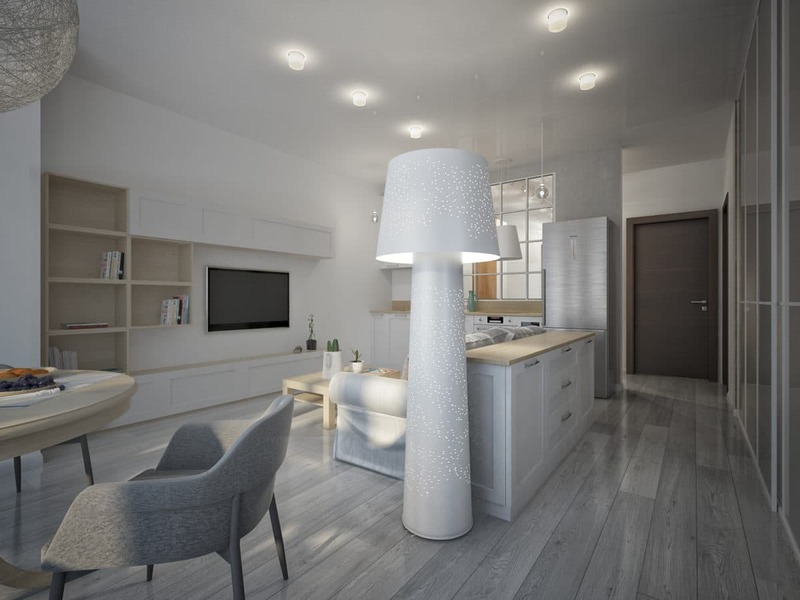 Soft group creates a cosiness in the room, and an unusual floor lamp with perforation attracts attention. The island partition-chest of drawers behind the sofa zonates the living room and increases the storage space. An array of light wood - from the whitened on the floor to the tabletops of golden tones - visually insulates the interior. The kitchen set and the set for TV are sustained in a common style and thus both unite both zones. 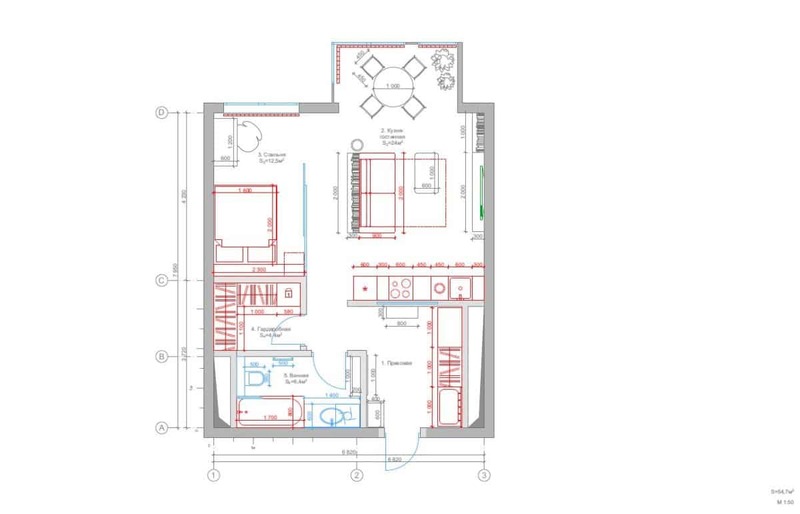 In the center of the layout is a studio zone,It is a combination of a room, a kitchen and a balcony adjoining it. The designer managed to allocate a kitchen area, a living room, a dining room, and in the sleeping area - a working area, all within a single room. Thus, a modest area of ​​space managed to combine many functions. The apartment itself is located in the north of Moscow in the LCD"Caramel". The original layout can be called uneasy: elongated, with a modest area of ​​glazing, she dictated the choice of a special solution. The designer proposed to combine the bedroom and the kitchen to achieve a sense of space. Thus, in one room were combined two windows, which allowed to fill the room with light. Such a solution fits perfectly into the general concept of Scandinavian style, in which special emphasis is placed on warm materials, such as natural wood and textiles. The interior combines two facets: It turned out to be spacious and multifunctional, but at the same time visually simple and easy. 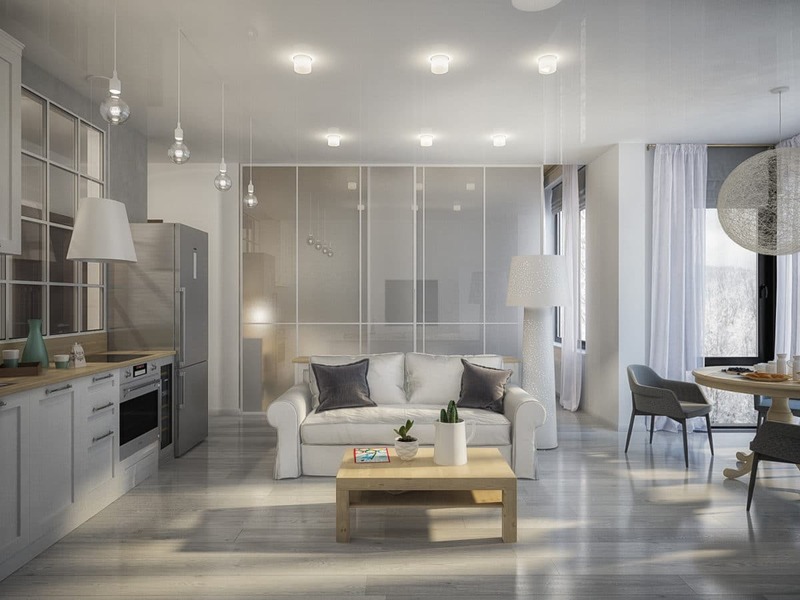 The apartment was filled with light due to competent re-planning with the unification of the kitchen and the room, whitened color and zoning with glass partitions. A single style could create a sense of scale, with each zone turned out to be individual. 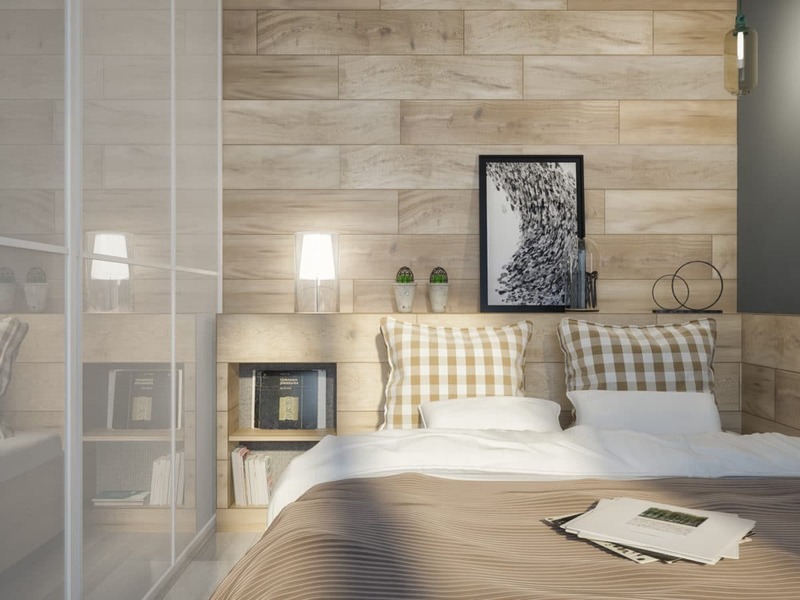 Elements of natural wood visually insulated the interior, especially the private bedroom area. The designer believes that it will be comfortable for the owner to live in the new apartment space.